QuickSpark contains CoEnzyme 1 which is known to play a primary role in energy production at a cellular level. The human body has millions of cells that require Coenzyme 1 to function at their best. Nicotinamide adenine dinucleotide (NADH) also known as Coenzyme 1, has crucial roles in many cellular processes. One of them is acting as a primary enzyme in the production of cellular energy. During this process Adenosine triphosphates(ATP), a naturally occurring molecule in the body essential for the creation of energy in the cellular level is produced. ATP is used for nearly every task in the human body. Alternative to Caffeine Based Drinks? Working hard, partying hard, trainng hard? Every time you drink tea, coffee, cocoa, chocolate, energy drinks or cola you are giving your body a 'hit' of caffeine. And there is only so much coffee or energy drinks you can consume! Caffeine and other stimulants normally work by making your body release more adrenaline. But there is only so much available and eventually you start to run out. This is when you get that crash( say at 4pm) - you feel exhausted and no amount of coffee will perk you up. QuickSpark is noticeably different from caffeine, no feelings of being " wired " and no subsequent dip. 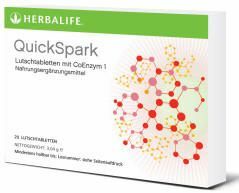 QuickSpark provides Coenzyme 1 which triggers ATP energy production at a cellular level. The more Coenzyme 1 cells you have the more ATP energy is produced. Everybody needs Coenzyme 1 to fuel your cells so body can function, so you can move your arm, blink, think and breathe! Quick-acting to help boost stamina and restore alertness and energy. Provides 10 mg of Coenzyme 1 which plays a primary role in energy production at a cell level. Caffeine Free. QuickSpark is not an artificial stimulant. Effective, fast acting sublingual lozenges that dissolve quickly and easily. Contains a patented formula of Coenzyme 1. Question and Answers, for example What is Coenzyme 1? Who can use this NADH supplement and Clinical Studies?